I'm been watching all the classic Doctor Who episodes, starting with the first episode that aired in November, 1963. I'm now on Season 18. And it started with something totally unexpected: a new theme. It's an electronic version of the Ron Grainer theme. I'm a little disappointed by it. I had changed my ringtone to the original theme back in February, and now that electronic abomination is on my TV. The starry background with the flashing lights were a shock to the system, too. You can tell this season aired during the days of disco. The Doctor got a new outfit, too. Still an overcoat and oversized scarf, but this is the burgundy-colored outfit. And, a question mark was introduced to The Doctor's wardrobe, on his collar. And, of course, at the end of Season 18, we get a new Doctor, as Tom Baker leaves the show. Three new companions are introduced during the season, and Romana and K-9 part company with The Doctor. 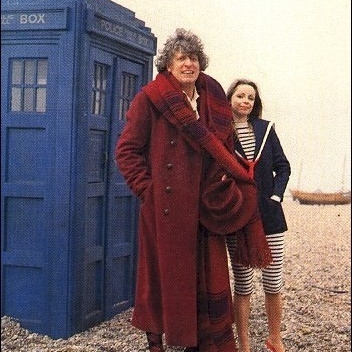 Behind the scenes, Lalla Ward (Romana) left the show while living with Tom Baker. They married in December 1980, around the time her character was written out of the show. They divorced 16 months later. It wasn't pretty. The season had seven 4-episode serials for a total of 28 episodes. And it was the lowest-rated season in the history of the franchise. One episode ranked 170th for the week in the UK. Part of the low ratings was due to the rise of ITV in the UK. An American import, Buck Rogers in the 25th Century aired opposite Doctor Who. The second serial of the season, Meglos (4 episodes), featured the return of Jacqueline Hill, who played Barbara Wright, a companion of of The Doctor (William Hartnell) in the show's first two seasons. She played a different character, with no connection to the 1960s British schoolteacher character. She wasn't the villain in the serial; she saved Romana's life by sacrificing hers. The villain was ... a cactus. Seriously. Which kind of explains the show's low ratings during the season. They did make the catcus capable of taking on other forms, including that of The Doctor. That allowed Tom Baker to play both the hero and the villain, as William Hartnell (in Season Three's The Massacre of St Bartholomew's Eve) and Patrick Troughton (in Season Five's The Enemy of the World) had done before. Besides seeing Jaqueline Hill again, the other highlight of the serial was seeing one of the characters kick K-9. Bill Fraser, who played General Grugger, agreed to play the role only if he got to kick K-9. The show runners agreed. It was great. the show. He's from an alternate universe called E-Space. At the end of the serial, he stows away aboard the TARDIS. The Doctor and Romana don't find out until half-way through the next serial. State of Decay (4 episodes) was a much-delayed serial. This story, or an early version of it, was set to open Season 15. BBC canceled the story when they decided they didn't want any vampire story taking away from their major production of Dracula they aired that year. 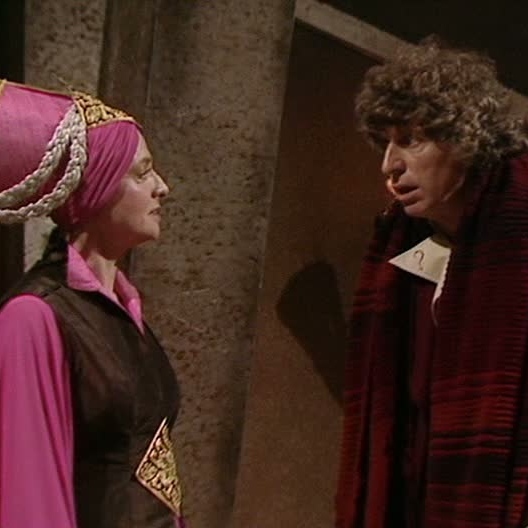 Now, three seasons later, the story was reworked into the story of The Doctor's and Romana's travels into E-Space. As, when originally scripted, The Doctor only had a single companion (Leela, at the time), the second companion, Adric, had little to do in the story. It seems like he was an afterthought ... because he wasn't thought of to start with. Romana and K-9 left at the end of the fifth serial of the season, Warriors' Gate (4 episodes). She had been summoned back to Gallifrey before the TARDIS wound up in E-Space. Since she didn't want to return there, and since The Doctor was going to consent to the the Time Lords' demand that Romana be returned, she elected to stay behind to help free some people or some other hippie thing. K-9 stayed with her because of some damage that prevented him from functioning in normal space. Or something. The Master made a return in The Keeper of Traken (4 episodes). He had the same, decaying body he had from the Season 14 serial, The Deadly Assassin. Well, different actor under the makeup, but you get the idea. And, at the end of The Keeper of Traken, he assumed the body of one of the characters, Tremas (Anthony Ainley). 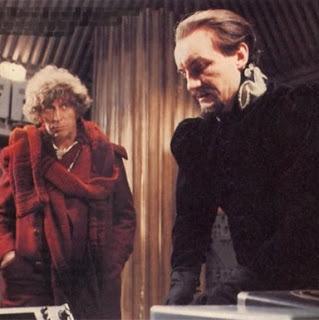 After The Master assumed the body of Tremas, he bore a strong resemblance to his previous incarnation, which was played by Roger Delgado. The character of Tremas looked nothing like Delgado, due to the makeup making the character appear much older than the actor (Ainley) was. All that to say they did a good job finally recasting The Master after Delgado's death. The Keeper of Traken also introduced the character of Nyssa (Sarah Sutton), who was daughter of Tremas. She didn't join The Doctor in that serial, but in the subsequent serial, Logopolis (4 episodes), she joins The Doctor. Tegan Jovanka (Janet Fielding) also joins as a companion to The Doctor, after entering the TARDIS, thinking it was a Police Call Box. Of course, Logopolis marks the end of Tom Baker as The Doctor. In a death scene stolen straight out of Star Trek: Genesis, The Doctor crawls across a metal scaffolding high above the ground to foil the villain's plans before falling to his death. After his three companions run to where he fell, The Doctor regenerates, with the help of ... The Doctor. Turns out a mysterious figure (The Watcher) following them around during the serial was actually a manifestation of The Doctor. When The Doctor (4.0) died, The Watcher appeared and merged with The Doctor, assisting with regeneration of The Doctor (5.0) (Peter Davison). The serial, and the season, ended with two credits for "Doctor Who:" Tom Baker and Peter Davison. That's not the first time there were two actors credited for the role -- remember The Three Doctors from Season Ten? -- but it is the first time an incoming Doctor was credited in an episode with a regeneration. Patrick Troughton wasn't credited at the end of Season Four's The Tenth Planet, and Tom Baker wasn't credited at the end of Season 11's Planet of the Spiders, despite each appearing on-screen as the newly regenerated Doctor. And, if you remember, Jon Pertwee wasn't credited because he didn't appear in Patrick Troughton's last episode, Season Six's The War Games. So, Season 18 ends the Tom Baker years, and the Dish of the Day from The Hitchhiker's Guide to the Galaxy begins his tenure. Funny thing. Even though I remember seeing some Doctor Who episodes starring Tom Baker on PBS many years ago, none of the stories that I've watched over these last few weeks ring a bell. It was like I had never seen them. I do think I'll remember them now.